Brassicas are also known as cole crops, a word derived from the Latin caulis, denoting the stem or stalk of the plant. Commonly grown and eaten brassicas include broccoli, broccoli rabe, and cauliflower (edible flower stalks), Brussels sprouts, cabbage (tight heads of leaves), kohlrabi (enlarged stem), collards, pak (or bok) choi, and kale (leaves), rutabaga, and turnip (roots). The seeds of the rapeseed cultivar are used to produce canola oil and mustard seeds are used for condiments. All members of Brassica genus are rich in vitamins, especially vitamin C, soluble fiber, and anti-cancer compounds such as 3,3-Diindolylmethane, sulforaphane, selenium, and carotenoids. Boiling reduces the levels of these compounds but quick methods of cooking such as stir-fry, steaming, or microwaving do not result in a significant loss. Brassica or cole crops grow best in full sun but they will tolerate some shade. This can be helpful when a garden has some areas that do not receive full sun the entire day. They can be planted in the less sunny areas freeing up the full sun locations for plants that require it. Deep, fertile, well-drained soils with plenty of organic matter are the best especially for spring planted crops. The soil pH should be in the 6.0-6.8 range. Have soil the soil tested at the UConn Soil Nutrient Analysis Laboratory. Brassicas are cold hardy and are best when they do most of their growing during the spring and fall seasons. Seeds can be started indoors in early April or 4-6 weeks before transplanting or direct sown once soil temperatures reach 40ºF. Older seedlings that have formed small heads do not do well. Fall plantings can be directly seeded into the garden June for Brussels sprouts, cabbage, rutabaga, and turnip, July for broccoli, broccoli rabe, cauliflower, and Chinese cabbages. Seedlings should be 12-18” apart in rows that are 2-3’ apart. A starter fertilizer that is higher in phosphorus (P) such as 15-30-15 or 16-32-16 should be added to the hole at the time of planting (if the soil test does not show elevated phosphorus rates). 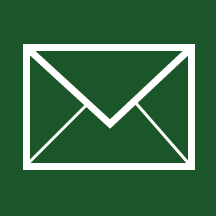 Well-rotted manure or compost should be used mid-season at a rate of 1 lb. per 25’ of row. 1” of water per week is required. Mulching with 3-4” of weed-free straw, dried grass clippings, or organic material will help the shallow roots retain water and will also provide weed control. 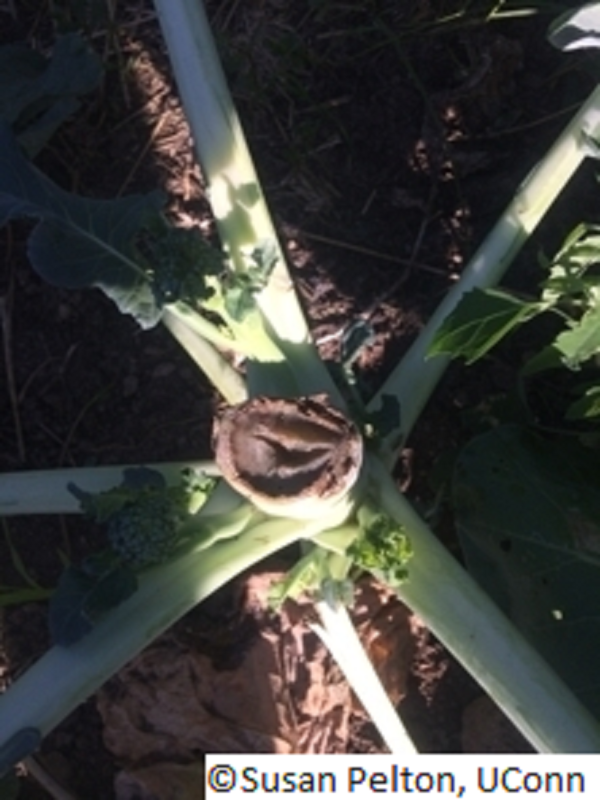 Broccoli, broccoli rabe, and cauliflower are harvested when their heads reach a usable size (5-8” in diameter) and before their flower buds open. The heads of white cauliflower become visible they need to have their leaves gathered and tied over the head to keep the curds blanched. Orange, purple, green, and self-blanching varieties do not require this practice. Cut stalks may continue to produce usable but somewhat smaller heads from side shoots. Bacterial soft rot can infect the cut stems after heads are harvested. Cut stems at an angle when harvesting, not horizontally, to allow water to run off. Water that pools on a flat cut can provide favorable conditions for bacterial soft rot that can infect heads that are not yet harvested. Brussels sprout produce many small heads along the stalk. When the lower heads reach the size of a quarter pinch off the growing point at the top to encourage the development of the sprouts that are already along the stalk. Cabbage heads should be firm to the touch, not springy. Cut the heads off above the outer leaves. Collards, kale, and pak choi can be harvested any time that the leaves are large enough for use, smaller, tender leaves for salads, larger, older leaves for cooking. Frost can improve the flavor of kale. Kohlrabi is harvested when the enlarged stem ‘bulb’ reaches 2-3” in diameter, before it becomes tough and bitter. Rutabaga and turnip should be harvested when the roots reach 3-5” in diameter and after several light frosts. A variety of diseases can affect brassicas. 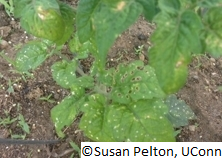 Among the most prevalent are Alternaria leaf spot, Black rot, Black leg, Club root, and Downy mildew. Disease-free seed should always be used, plant debris should be removed at the end of each growing season, rotate plants when possible. See our fact sheet Vegetable Garden: Basics and Plant Selection for some resistant varieties. The best disease and pest control can be achieved by rotating cole crops, only planting in the same location every 3 years if possible. Flea beetles, Phyllotreta cruciferae, are tiny (1/18th to 1/16th”) and most of the damage is done by the adult flea beetle as they feed on foliage, cotyledons, and stems. They create small pits and ‘shot’ holes. Plants can appear wilted and stunted. Flea beetle populations tend to reduce as the season goes on so consider planting later in the season when plants can generally outgrow beetle damage. Remove old crop debris to prevent overwintering. Root maggots, Delia radicum, tunnel into the roots of young seedlings and transplants, causing plants to yellow, wilt and die. These pests have several generations per year although their damage is at its worst during a cold, wet spring. Row covers may be set up in mid-May to prevent the adult fly laying eggs. Remove any host plant debris in the fall to prevent the pupae from overwintering or till the soil over to expose the pupae to the winter cold. 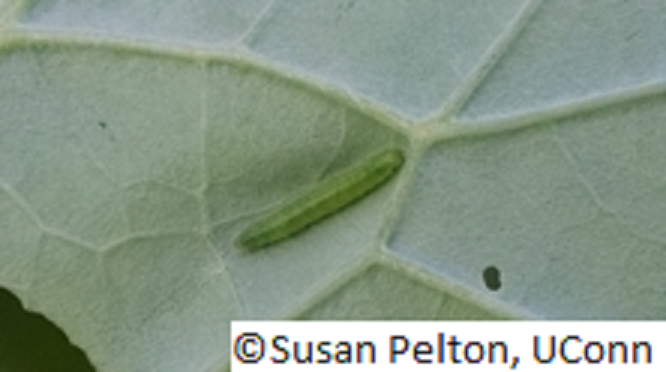 Cabbage loopers, Trichoplusia ni, Cross-striped cabbageworm, Evergestis rimosalis, and Imported cabbageworms, Pieris rapae, are the larval stage of several different moths that do significant damage to cole crops. 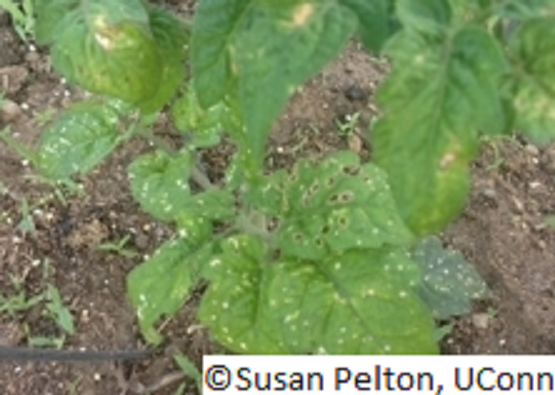 Row covers or the use of Bacillus thuringiensis are two options for control. 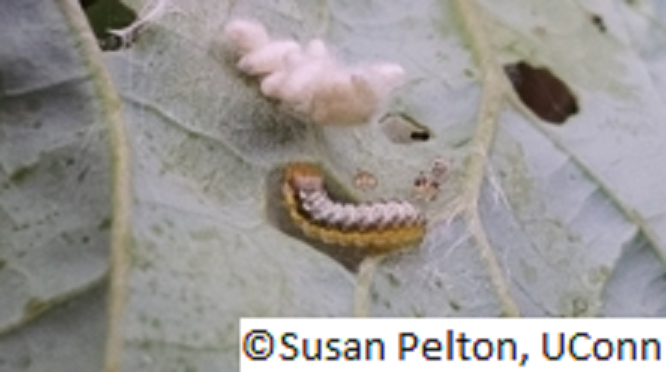 See the fact sheet on UConn’s Integrated Pest Management site: Cole Crop Caterpillar Pests for additional information.